After their show of marvellous musical excess – Pines of Rome etc – it was a real pleasure to hear these musicians in a much more restrained classical programme (St John’s. Smith Square, 6 March). Conductor Michael Alexander Young started with a fine Zigeunerbaron Overture, which showed a sure touch in this delightful light style; the rhythms were well sprung and the whole had a real Viennesey swing to it. To balance this, the first symphony of Strauss’s friend Brahms was given with an intensity and insight which was second to none. Young started as he meant to go on, with weight and power, and the storm of the first movement was balanced by a warm and beautiful slow movement. The light intermezzo of the third movement allowed a little rest before he unleashed a finale of great strength, unleashing an almost tsunami of sound to bring about the final climax and crown the work with a glorious peroration. But the prize of this show was Richard Strauss’s Oboe Concerto, admirably played by Victor Aviat. I’ve always found this a difficult work because many conductors cannot see it as a classical chamber work because of the composer’s earlier big boned works. Here Aviat and Young, for the first time in my experience, found exactly the right tone and feel for the music and delivered a performance without ever seeing it necessary to force the music and showing it to be the winsome flower it actually is. This was magnificent. The combination of Rachmaninov and Mahler at their subsequent show (29 May, again at St John’s) might have seemed an odd juxtaposition but we mustn’t forget that the second performance of Rachmaninov’s 3rd Concerto in New York was conducted by Mahler with the composer at the keyboard, so their meeting in a show of the Russian’s Isle of the Dead and the Austrian’s 5th Symphony isn’t such a strange meeting as many might expect. Isle of the Dead is an odd piece, relying almost entirely on atmosphere, the themes, such as they are, flit here and there, never settling to anything substantial. Carried along by the superb orchestration, the ebb and flow of the “plot”, for want of a better word, and by allowing full weight and presence to the brass, not telling them to play down, Young built a towering edifice of great force, dominated by terrifying climaxes, and achieving a vision of the afterlife which is one to be feared but is ultimately, of peace and reconciliation. This was such a fabulously realised performance and interpretation that it rather overshadowed the Mahler 5th! The five movements divide into three sections, the first two being a long funeral oration of great sorrow and anger, the third a mini concerto for horn and orchestra, and the fourth and fifth a relaxation and bucolic dance. In some respects the three parts made odd, and not entirely satisfying, bedfellows – perhaps in reality there are actually two Symphonies here – but, again, Young showed great insight into bringing all the disparate elements together to make a cohesive whole. His handling of the funereal music was superb, big and bold and followed The Isle of the Dead as a kind of addendum to that piece. A nice juxtaposition here. For the third movement, principal horn Emma Whitney came to the front of the stage and gave a magnificent performance of the exacting solo part – and played so well that a composer friend of mine said that he’d be more than willing to write a Horn Concerto if she were to play it. Praise indeed. The, overly, famous Adagietto was given exactly the right tempo and proved to be what it actually is, an 8 minute intermezzo before things get going again in a frenzy of country dancing. Young achieved a fine performance which made musical sense, not always an easy feat in Mahler, and was as satisfying as it should be. It has been my privilege to hear three concerts by this young conductor and orchestra and I am more than happy to have made their acquaintance and I look forward with anticipation to their further concerts. "A concert by the Charities Philharmonia, under Michael Alexander Young, is a promise of fresh air breathed into whatever classic work they're playing... The conductor drew playing that was laced with the heat of the composer's passion... The exuberance of this immensely talented group of musicians approached brashness at times but, with an expansiveness matching Sibelius' heartfelt vision, it was no wonder the audience greeted the heady conclusion with a roar of approval. Clarity and sharpness characterised Young's approach throughout and, if this orchestra deserves attention it's not just for their commitment to 'outstanding causes' but the extremely high quality of its music-making too." “The programmes of the Charities Philharmonia have been anything but conventional, with the largely young personnel of this Orchestra tackling, under their very talented and commanding conductor Michael Alexander Young, some of the most difficult works in the repertoire… The programme at St John's, Smith Square on 4 December was no exception, being crowned by a performance of The Rite of Spring that was absolutely outstanding. The rich acoustic of St John’s is ideal for the overwhelming power and sensitivity which lies within this extraordinarily original masterpiece, every element of which was admirably conveyed. " "Another fantastic concert from Charities Philharmonia...As well as a star turn from Tamsin Waley-Cohen in Prokofiev's early Violin Concerto, there was also a colossal and relentless performance of Stravinsky's Rite of Spring...The final word should go to Michael Alexander Young, a conductor who demonstrated that although this piece was written for a full ballet company, it can be danced by one." "...The idea of a "charity orchestra" put me in mind of an anodyne evening of soppy and sloppy hits. This wasn't the case. This Orchestra proved to be a fire-breathing ensemble capable of almost anything ... The orchestra was fairly subdued at first, but when they got hold of the main theme for the first time they rocketed into the most heart-soaring, reckless playing I've ever heard. If music from the Romantic period is supposed to sacrifice pristine logic for the benefit of blind emotion, then this was a perfect performance." 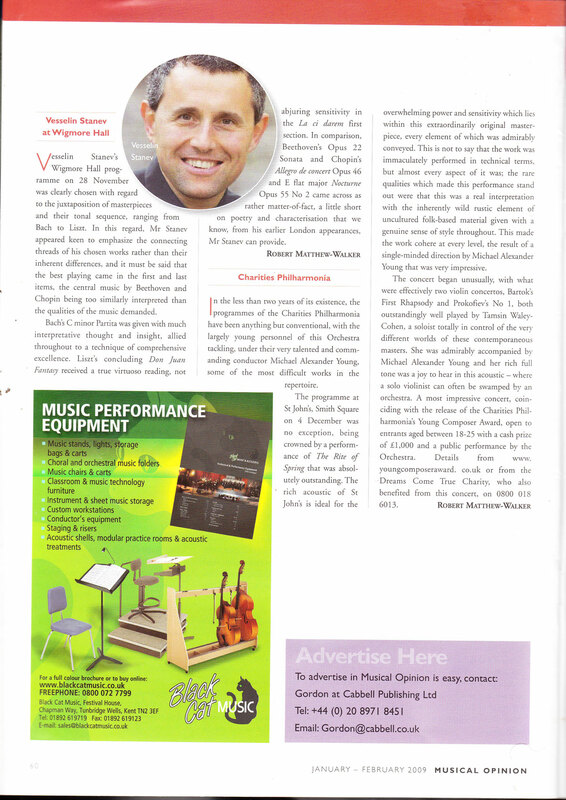 "...this worthy aim is backed up by fine musicianship under the inspiring baton of Michael Alexander Young and their autumn concert saw a programme of Austro-German pieces superbly played by these predominantly youthful musicians... While appearing quite contained on the podium, Young led an impassioned performance that sent shivers down the spine... The orchestra's articulation of the various episodes from Beethoven's pastoral adventure was crystal clear and with some lovely work from the woodwinds in particular, this fresh approach to a well-worn symphony was a joy to hear." "Conductor Michael Alexander Young and his players caught the mood of Debussy’s impressionist masterpiece to perfection...An uplifting evening, for performers and audience alike." “Seldom do you find such combination of youth, musical ability and purity of meaning behind an occasion…this has been a perfect start to our London vacation”. “I went to the concert on 2nd June and thought it was one of the best I have ever been to. We were most impressed by the clarity and passion of the orchestra and by the acoustics of the venue which led to being able to hear details which we had missed when listening to recordings or other live orchestral music. We live nearly 100 miles from London, and were so impressed that we shall make sure to attend future concerts whenever we can. “It's some time since we enjoyed a concert so much! An interesting, varied programme, wonderfully performed”. “I wish Charities Philharmonia held more concerts, I have never heard a concert organised for charitable causes of this standard before...truly captivating – will definitely come again”. “I didn't have a pen on me last night at St John's Smith Square so I couldn't fill in your questionnaire but I really wanted to let you know how much I enjoyed the concert. I have seldom seen/heard a concert given with such verve, excitement and accomplishment. The musicians played for all they were worth with such skill, sensitivity and feeling it really made the whole evening (and in particular the Leningrad) a unique and moving experience. I've had the Leningrad on CD for some years but have never heard it played live before. Hearing it 'for real' simply blew me away - a pity the CP haven't made a recording yet! Please do add me to your database, I will certainly be supporting your orchestra in the future, and once more thank you for a simply wonderful evening - please pass on my words to the musicians if you think fit. By the way, I found out about you from The Independent magazine listings only a few hours before the concert! “The Music Director showed deep musical insight and elicited an inspired performance”. "What a brilliant concept – I don’t usually attend classical concerts, I’m always too busy working in the office until late... But the thought of sponsoring charity in this way this has opened my eyes and I’ll definitely attend more Charities Philharmonia concerts. The music was electrifying and the cause was grounding." "It is very moving to see such talented young professionals put themselves forward in this way, giving their heart and soul for both the cause and the music – I must say I was overwhelmed by the sheer commitment and passion on display last night."